This box includes one highly detailed Aggressor Class Dropship. Manufactured from high-quality acrylic and easy to assemble, this model makes a superb addition to any Science Fiction wargame or a fine display piece for modelers, painters and collectors. The Aggressor makes an inspiring piece of table-top scenery, and will also make an excellent objective. Alternatively it can soar high over the battlefield taking part in the action. This version of the Aggressor is aimed at owners of 6mm or 10mm miniatures, but with no scale-specific features the model can be used in any role on the tabletop. 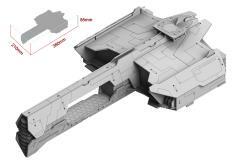 This version of the Aggressor Planetary Dropship is 380mm Long, 85mm High and 210mm Wide. Full assembly instructions included along with acrylic flight stand.